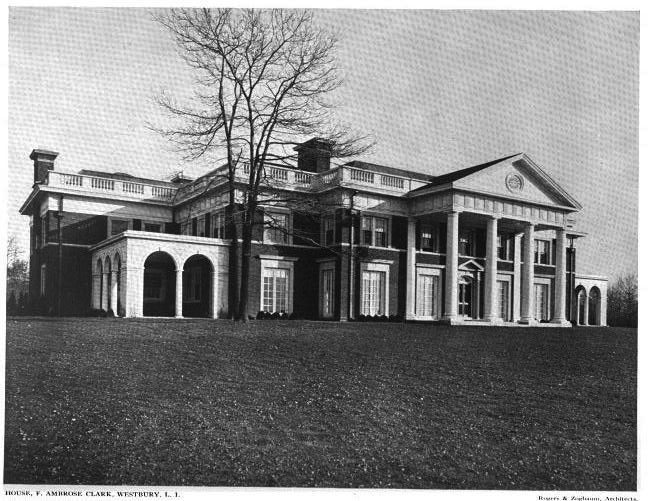 'Broad Hollow House', the F. Ambrose Clark estate designed by Rogers & Zogbaum c. 1912 in Old Westbury. Clark was a director with the Singer Sewing Machine Co. and a noted horseman. 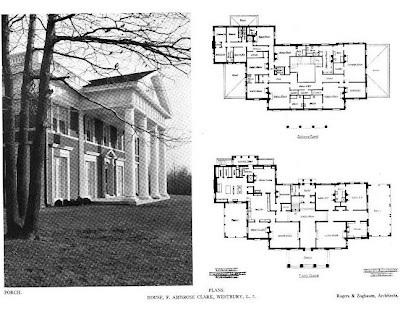 Click HERE for more on 'Broad Hollow House' and HERE for more on the estate's barn complex. The house was destroyed by fire c. 1968 but click HERE to see where 'Broad Hollow House' stood on google earth. The looks as if you opened all those ground floor French doors it would feel as if you weren’t really indoors; a characteristic I like. I’m surprised the one interior photograph shows no furniture since there are paintings on the wall. • The pantry feeds into the dining room, breakfast room, & the main hall. • In the top right-hand corner are two guest rooms with a connecting bath – every house should have at least one bedroom & one full bath on the ground floor. 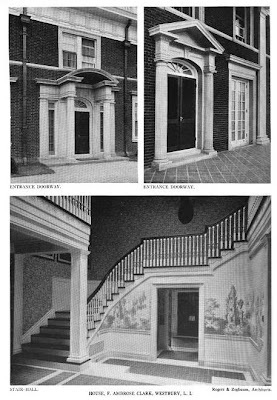 • Continuing the discussion about elevators – there is one in front of you as you enter from the servants’ porch. • The living room & dining room are pretty obvious; that is a study in the bottom right corner; but I can’t read the name on the room (with the fireplace) on the right just before you enter the servants’ hall – it’s too far away from the front door to be a reception room & a study has already been identified … it could be for staff use like the housekeeper’s office … I dunno. • At the far right is the owner’s room with a nursery below it & that connects to a child’s room. Interestingly, the owner’s bedroom has two bathrooms (way ahead of its day) – one on either side of a large dressing room (that has a fireplace in it). • Five guest rooms, three with their own bath & two sharing a connecting bath. This house could have easily been used by a contemporary family … damn fire! A fire caused by careless workers I believe when they were doing roof repairs, otherwise this home would still be standing today. The site still has a commanding view over acrs of unspoiled fields and horse paddocks. Damn fire correct! Also damn careless workers! If memory serves me, the houses was also expanded later by the addition of a ballroom. I assume it replaced the porch on the right side of the floor plans, but I am not certain. Great find, I have always been curious about this house. I love the stair hall, very sad to hear about the fire. Slightly amusing is the vanity director title provided Brose at Singer when he openly said working in an office - or for any company - wasn't his calling. Rather he was born to live in the saddle. Monica Randall's book I believe cited a ballroom being constructed. If I'm not mistaken it was on account of British royalty making the rounds of the North Shore. Ambrose also owned a large property in England as well and friendly with the Royal family. The lands of Broad Hollow during its height were opened to the public many years for steeplechasing hosted by Clark. Some 400+ acres of bucolic lands kept so wonderfully well past the end of WWII. Anyhow I digress - does anyone know what the planned intent was for the manor house with SUNY? Was it to be administrative offices or perhaps the Chancellor's residence? I took a few pictures of his grave last spring where he alone rests beside Kellsboro Jack (the Grand National winner at Aintree, Eng) and Buttons his ever faithful hunt dog. Any photo of the front facade? Kellsboro, thanks for the link to the ‘Never Say Die’ story – if ever someone just missed grabbing the brass ring in life it was Pete Best. 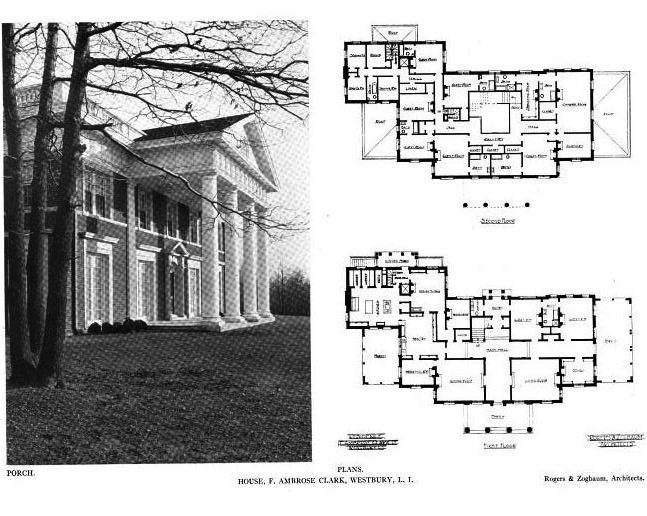 Rob, if you’re talking about ‘Broad Hollow House’ the front façade picture has the columned portico. • In the picture of the front of the house the service wing doesn’t wrap around the back of the loggia as it does in today’s picture. Looking at today’s floor plan I don’t know how the service wing could have originally been smaller unless it was in the basement. • The picture of the back of the house has the complete service wing but the photo is a mirror image of what it should be. I've always wondered why Broad Hollow wasn't retained by his 2nd wife Augusta and instead parted with as was the mansion in Aiken, SC. She continued to live at their Dakota apartment, the aforementioned Cooperstown estate, as well as a residence in England until her death in 1981. Update on my photo confusion -- if the July 30, 2008 photo of the front of the house is also a mirror image then the service wing would be on the far side, out of sight, & the photo would make sense. Only Zach knows where he got those photos so only he knows the likelihood that they were flipped at some point. The photos are backwards...I had taken those pictures with my old cell phone camera (before they got much better) and they came out backwards. I will try and fix that. The pictures come from the Nassau County Museum Collection...a mysterious filing cabinet in the back of a warehouse in Westbury that took me 6 months to track down 3.5 years ago. Thanks Zach, I've already flipped the pictures to make sure my theory was correct. I'll e-mail them to you. I like the image of you tracking down a museum file cabinet, confronting hostile archivists. Seriously though, we all appreciate your dedication. With the parapet and bold frieze giving so much visual weight, I would have rather seen the house raised on a plinth terrace rather than having the floor so close to grade. I love the arched entrances at the gatehouse and barn complex however. The portico is, well, vigorous, no? Accessed the New York Times coverage of this fire, and all are right that it was roof workers who caused the fire with hot tar. According to the Times, however, the fire hoses had to extend 4,400 feet from a service road of the Long Island Expressway in order to reach the building which must have slowed down the process of saving the building. The article says that the only part of the mansion that was unharmed was the one-story south wing, known as the Prince of Wales ballroom, so named since it was built for him for a visit to the home in 1922. Although it looks a bit barren here, Monica Randall's book shows a different story. In her 1960's era pictures, with some vines on the house, trees grown up (including the single one left of the portico still there)& some bushes the house had really settled into its' landscape beautifully. Thanks for some floor plan i.d. The ballroom must have replaced the loggia on the right hand side. What are the two rooms off the hall on the top right - ground floor bedrooms? Just why is the Garden Front so much worse than the Entrance Front? Chip, you're welcome & yes, two ground floor bedrooms with a connecting bath between. From what I can tell, yes, the ballroom replaced the loggia on the right (& at the same time the loggia on the left -- the service wing side -- was removed). Ancient, if you're talking about the Bing views the garden side now has a huge, rectangular addition that trys to match the house but comes no where close to looking like the garden side of a house. If you're talking about the black & white pictures I think the answer is in the center of the house -- how those dormer windows sit on top of that second floor loggia & that single, rounded top set of French doors -- looks odd. I liked the house better with the two loggis's,I'm sure the prince would have rather been invited to the estate to partake in some bootleg gin rather than a ball. Ancient, I'll rise to the bait. The short answer is that the architect wasn't particularly talented (the entrance front doesn't impress me all that much either). The entrance facade has a few problems of scale and integration, and the rear loggia idea just doesn't integrate well. Poorly spaced. As for the modern function rooms added to the rear in the current guise as Alumni Center for the BC law school, they follow the unwritten rule that all such additions must be clumsy. One more comment from me -- notice in the Bing view that those three awkward dormers on the back side of the house in the black & white photo were replaced with dormers that match the five dormers on the front; so an attempt was made to correct the look back there, probably long before the BC law school built its clumsy addition.